The document is underpinned by the requirements of the Special Educational Needs and Disabilities (SEND) Code of Practice 2015 and provides a summary of the school’s SEND policy. has a disabled toilet on the ground floor. have a disability (physical or mental impairment which last for more than twelve months) and the impairment has a substantial and long-term adverse effect on their ability to carry out normal day-to-day activities and prevents or hinders them from making use of the educational facilities of a kind generally provided for others of the same age in mainstream schools. a child’s fine or gross motor skills or other movement. There are four broad areas of need identified in the SEN Code of Practice. However, the purpose of identification is to work out what action the school needs to take, not to fit a pupil into a category. In practice, individual children often have needs that cut across all four areas and their needs may change over time. For instance, speech, language and communication needs can also be a feature of a number of other areas of SEN, and children with an Autistic Spectrum Disorder (ASD) may have needs across all areas, including particularly sensory requirements. Children with speech, language and communication needs have difficulty in communicating with others. This may be because they have difficulty saying what they want to, understanding what is being said to them or they do not understand or use social rules of communication. Children with Autistic Spectrum Disorder (ASD) are likely to have particular difficulties with social interaction. They may also experience difficulties with language, communication and imagination, which can impact on how they relate to others. Support for learning difficulties may be required when children learn at a slower pace than their peers, even with appropriate differentiation. Learning difficulties cover a range of needs, including moderate learning difficulties (MLD), server learning difficulties (SLD), where children are likely to need support in all areas of the curriculum and associated difficulties with mobility and communication, through to profound and multiple learning difficulties (PMLD), where children are likely to have severe and complex learning difficulties as well as a physical disability or sensory impairment. Specific learning difficulties (SpLD), affect one or more specific aspects of learning. This encompasses a range of conditions such as dyslexia, dyscalculia and dyspraxia. Children may experience a wide range of social and emotional difficulties which manifest themselves in many ways. These may include becoming withdrawn or isolated, as well as displaying challenging, disruptive or disturbing behaviour. These behaviours may reflect underlying mental health difficulties such as anxiety or depression, self-harming, substance misuse, eating disorders or physical symptoms that are medically unexplained. Other children may have disorders such as attention deficit disorder (ADD), attention deficit hyperactive disorder (ADHD) or attachment disorder. Some children require special educational provision because they have a disability which prevents or hinders them from making use of the educational facilities generally provided. These difficulties may be age related and may fluctuate over time. Many children with vision impairment (VI), hearing impairment (HI) or a multi-sensory impairment (MSI) will require support and/or equipment to access their learning. Some children with a physical disability will require additional ongoing support and equipment to access all the opportunities available to their peers. 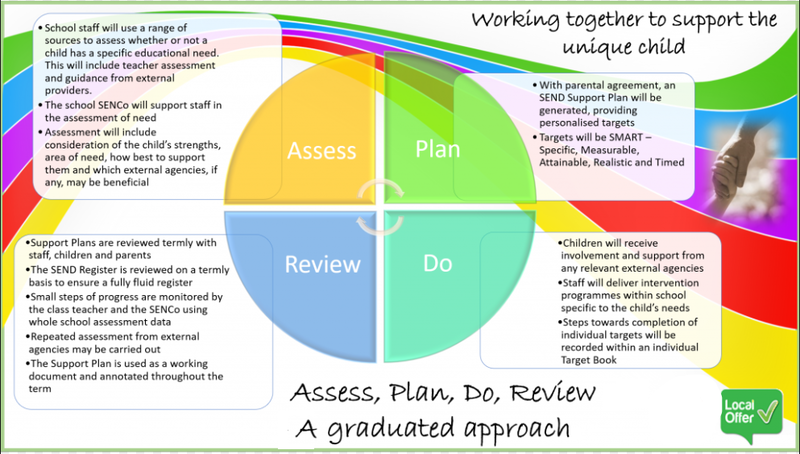 As set out in the SEND Code of Practice, the school follows the Graduated Approach to Assessment, which follows the four stages of Assess, Plan, Do and Review. This allowed for a more personalised approach to the identification, planning and assessment of SEND. We encourage parents to discuss at an early stage their child’s development and potential needs. The sooner we are aware of difficulties experienced in early childhood or any diagnosis or support already in place before they start school, the sooner we can determine the most appropriate level and methods of support for the child. Parents are asked to contact the school’s SENCO and share concerns or information as soon as possible. Often, parents have letters and reports from medical professionals or other agencies which can be very helpful to school or provide the school with a contact for further information and advice. The school will involve and discuss matters with parents, particularly regarding initial assessment, including that carried out by specialists (e.g. Educational Psychologist), from the outset. Once it has been determined that a child has SEN, a plan will be put in place to make clear the areas of the difficulty experienced by the child, the additional provision and support that is needed to secure progress and development, and the outcomes which are expected to be achieved. This plan will be drawn up by the class teacher and SENCO with the involvement of parent and, where possible, the child. These plans are known as My Learning Plans. Where appropriate, the school will have a One Page Profile for those children with an EHCP (Education or Health Care Plan) to ensure that the views and needs of the child are recorded, valued and contribute, where possible, to any planned support or teaching style. Not all children with special educational needs will have a One-Page Profile as their My Learning Plan (MLP) will provide a summary of their specific needs. One-page profiles capture important information to enable teachers to personalise teaching and learning for each young person. This information enables teadhers to be aware of the strengths, interests and specific support needs of their pupils. One-page profiles can be used to inform action planning and target setting, so that these reflect what is important to the child and how best to support them. This can make targets more meaningful and relevant to the child. One-page profiles are means for a child to have a voice in how they are supported in school, and to have their strengths and what is important to them as an individual to them acknowledged. One-page profiles are shared between staff, particularly when a child moves from one class to another or has another teacher part-way through the academic year. One-page profiles are also a way for parents/carers to share their knowledge and expertise about how their child is best supported. The school provides for children with a range of Special Educational Needs in a mainstream setting, including those with Statements of SEND and, from September 2015, Education and Health Care Plans. However, as a mainstream school, Northenden Community School is not a specialist provider and does not have the facilities which benefit some children with SEND in other schools. The school mainly supports children with SEND through additional resources and support in a classroom setting but also provides support for children in small groups outside the classroom. The school also has links with and takes advice from schools with specialist provision. A child with one or more special educational needs or a disability will have a personalised Provision Map which shows exactly what extra support they are receiving, and from whom, to address their additional needs. This is reviewed on a termly basis by the teacher, teaching assistants, the SENCO, any relevant external agencies or specialist support, and parents. All children with SEND are taught in an inclusive setting (alongside their peers in the classroom) and have access to the full national curriculum, activities and resources which may be adapted for their individual needs. Children with SEND are also taught on a one-to-one or small group basis at various times during the week so that they benefit from focussed time and space without the distraction of other classroom activities and their peers. Once we have identified a child as having a Special Educational Need or disability , the school will plan to provide appropriate support for the child. This support will be planned by the class teacher, working with the school’s Special Educational Needs Co-ordinator (SENCO) and, if necessary, professional and experts from outside agencies. The child’s needs and provision will be recorded as part of an My Learning Plan which will set out the difficulties experienced by the child, the needs of the child and specific actions which will support the achievement of clear outcomes. These outcomes may be related to specific learning targets (e.g. in reading, writing or mathematics) or aspirations for the child’s social, mental or emotional health. transition support for joining the school or moving onto another school. The majority of additional support provided for children with SEN will take place in the classroom setting alongside their peers. However, there may be occasions when children with SEN are taught outside the classroom for a period of time. This usually enables the child, or a group of children, to focus without distraction on a specific task with the support of a teaching assistant or specialist teacher. The school makes the distinction between the various levels of need and support required by children with SEN. Some children will have greater needs and require more support than others at different times. Wave 2 is concerned with providing some specific and time-limited additional support for groups of pupils or individuals who are falling behind age-related expectations. 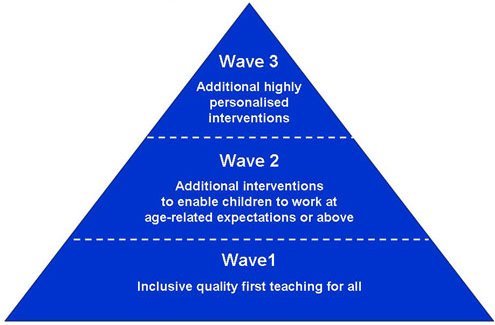 Waves 2 interventions usually aim to improve skills and understanding in English and Mathematics and are targeted at pupils with similar needs or gaps in their learning. Examples of Waves 2 interventions are those aimed at developing social communication or improving specific skills in reading, writing or spelling, or number. Class teachers manage the level of the support required; the intervention programme may be delivered by the class teacher or a teaching assistant who has been trained to deliver the programme. SEN support at Wave 3 aims to provide targeted and possibly specialist support to a small percentage of pupils who require a higher level of support in order to meet their needs. Where additional support over a period time has had little or no impact on a child’s progress and it is clear that the child may need more support than the school can provide from its ordinary budget, the parent or school may apply to the Local Authority for a statutory assessment of the child’s needs. The local authority will need to make a more detailed investigation of a child’s needs using specialist advice. If this assessment decides that the child needs more assistance than the school can provide, then the local authority will go through something known as the ‘statutory assessment process’. Only a few children will need a statutory assessment – usually this will be requested by the school , but parents have a legal right to request a statutory assessment if they feel the school is unable to provide the right level of support. If the local authority decides not to carry out a statutory assessment parents have a right to appeal against this decision. The local authority will tell you about this, how to appeal and the time limits. If the local authority does carry out an assessment there are timescales for this. The Information and Advice Service (see below) can offer more advice on this. One of the most important things to remember is that parents have an essential part to play in the process and parental views are very important. The local authority will contact parents and a range of professionals asking for views and information regarding the support that has already been offered and the impact of this support. If the application is accepted, a range of information from a number of sources will be considered by a independent SEND panel who will determine if a higher level of need and support are required by the child and how this might be implemented. Section K: copies of all of the advice and information obtained as part of the EHC needs assessment. Depending on the level of need, the school will be given additional funding to support a child who has an EHCP. It is up to the school to determine how this money is spent and the level of support which may be needed to meed the needs of the child on a daily basis. Some children will require a significant amount of one-to-one adult support whereas others may be able to work independently in the classroom but need teaching in small intervention groups or on a one-to-one basis for specific aspects of their work, e.g. spelling. The school provides for children with a range of medical needs. Staff are trained and procedures are in place, for example, to support children with allergies, including anaphylaxis, epilepsy, asthma, diabetes and eating disorders. The school also has experience of supporting children with more complex medical needs, including children undergoing treatment for serious illnesses. The school is flexible in its approach and acknowledges the need for some children to attend a range of hospital appointments during the school day. The school does not normally administer short-term prescribed medicines. It does support the administration of medicines over a long-term period. The administration of all medicines and any support for children with medical needs is carefully planned and recorded. Advice will always be sought from parents where uncertainties arise regarding the condition of a child or medication to be administrated. The school has some facilities to offer support for children with disabilities. The vast majority of classrooms and teaching spaces are on a single floor, with many classrooms having external doors enabling access for people who use a wheelchair. Not all of the school’s external doors are step-free at this time. The school has disabled toilet facilities on the ground floor in the main building. The school can also make adaptations for children with visual or hearing impairment. All children with disabilities have individual plans which make clear the adaptations and additional support required. This also includes Personal Evacuation Plans which come into action should the school be evacuated. Pupils with disabilities are provided with additional adult support in these situations. The school also recognises that many children experience difficulties with their learning for other reasons with them having an identified Special Educational Need. This may because of family circumstances, bereavement or because the child has experienced trauma or neglect in their life. This can affect children who are looked after or who have been adopted, for example. Children for whom English is an Additional Language (EAL) may also experience barriers to learning. However, EAL is not a Special Educational Need and care is taken to determine whether a child’s progress is affected by their home language or a special educational need. The school does therefore identify all children who require addition support as having a Special Educational Need but still aims to address the needs of these children through plans and a good partnership with parents. We believe that a positive relationship with all parents is important. We acknowledge that parents often know their children best and can share lots of information about their child’s development, needs, strengths and difficulties. We aim to involve parents of children with SEN from the very early stages of sharing information, identifying initial needs and creating support plans, through to reviewing the effectiveness of the support for the child. The views of parents are very important in this process. Parents are consulted on a termly basis and their views are recorded on the child’s My Learning Plan. We acknowledge that on entry to the school, parents may be keen to share information about their child and their needs. We value this information and ask parents to be honest and realistic in the information they share about their child. Whilst many parents are keen to ensure that their child’s needs are recognised and assessed at an early stage, we are also aware that some parents find it difficult to acknowledge that their child may have additional needs and may not wish to share their concerns. The school will work with all parents for the benefit of the children in our care and we encourage an honest dialogue between home and school about children’s needs and the support they may require. Sometimes, parents refuse to agree to SEND assessments for their child. This is not always helpful and may hinder the future progress and support for the child. The school also recognises that the views of the child are important and aims to involve all pupils in the decisions that affect the way in which they are taught. Children will be involved in reviewing their learning on a regular basis and setting their own targets, where appropriate. We may also ask children to complete a one-page profile of themselves. This profile includes the child’s likes and dislikes, their hobbies, how they think they learn best, what distracts them, and what they feel are their strengths and things they can do better. Some children also have their views recorded on the My Learning Plan which is reviewed on a termly basis. All plans which cater for the needs of children with SEND will have clear outcomes to be achieved over a period time. The effectiveness of the plans and additional provision in the impact these have had on the child and their progress will be evaluated and reviewed each term. For children with an Education and Health Care (EHC) Plan, the effectiveness of the plan will be reviewed in consultation with the Local Authority on an annual basis. This is called an annual review meeting and a member of the Statutory Assessment team may be asked to attend if there is a possibility that the provision set out in the plan needs to change. Parents will have opportunities throughout the year, including at parents’ evening, to discuss the implementation of a child for their plan, including the ways in which the plan and its outcomes might be supported and reinforced at home and through additional activities. Where appropriate, the child will also have an opportunity to review their plan and have a say in what has worked well and the progress they are making. commission and have oversight for staff training and development in SEND, ensuring that staff have adequate skills and knowledge to support children with different aspects and degrees of SEND. When a child is identified as having SEN, the school will appoint a Case Manager for the child. This will usually be the SENCO but could be another member of staff, including the Headteacher. The Case Manager will be responsible for main contact with parents and for managing and reviewing provision for the child. The Governing has strategic oversight for all school policies. There is a named governor for Special Educational Needs. At the time of writing, this governor is Anna Bunney, a Co-Opted Governor. This governor and the School Improvement Committee have a role in ensuring that the school carries out its statutory duties with regard to SEND. chairs and services the SEN Panel, which determines requests for statutory assessment and decides the level of additional funding to be allocated to individual pupils with a new EHC plan who are placed in mainstream schools. IAS Manchester is the new name for the Parent Partnership Service. IAS Manchester offers independent information, advice and support to parents and carers to increase their involvement in the education of their children with Special Educational Needs and Disabilities (SEND). The service also ensures that parents, carers and young people have access to information and advice about issues relating to the child or young person’s health and social care. Parents who wish to raise concerns about the school’s provision for their child are encouraged to discuss matters in the first instance with the class teacher or SENCO. Should matters not be resolved, parents are encouraged to discuss matters with the Headteacher and, should all else fail, make clear their concerns or complaints in writing, in the first instance to the Headteacher and then to the named Governor with oversight for Special Educational Needs.